Edgar Allan . . . Anybody that enjoys reading knows what comes after. Poe has that kind of star power in the literary world. Few people who are serious about writing (or reading, for that matter) have not read at least some of his works and are familiar with many more. I’ve been a Poe boy since I was a child, which is a time receding so quickly into the past that I begin to wonder if Edgar and I might not have been on the same Little League team. Mystery writers know him as the father of their genre, and go about coveting the tiny bust of his woeful countenance that is annually awarded to a fortunate few by the Mystery Writers of America, while horror authors claim him as master of their dark arts. He strides his two worlds like a pale, unsteady colossus. Crime fiction is normally the neighborhood I live in, but I do, occasionally, cross the tracks into Horrorville. I find the line of demarcation hard to see in the darkness. My most recent foray was inspired by Poe himself, or more accurately, by a mysterious man obsessed with the long-dead author—the “Poe Toaster” as he came to be known. In my story I attempt to answer the question of why the three roses and an open bottle of cognac were left on Poe’s grave each year for over seventy years, and why it came to an abrupt end on his 200th birthday in 2009. It seemed the least I could do for the tired-looking genius that spawned the careers of so many writers around the world. It is my little tribute. Sometimes my crime fiction contains elements of horror, my horror fiction elements of the mystery genre. My novel, “The Thirteenth Child” is most certainly a horror story, but its protagonist is a police chief pursuing investigative leads into the disappearances of three children. His antagonist is a Rumpelstiltskin-like vampire (though the chief goes through nearly the whole novel without knowing this), a character not often found in police line-ups. 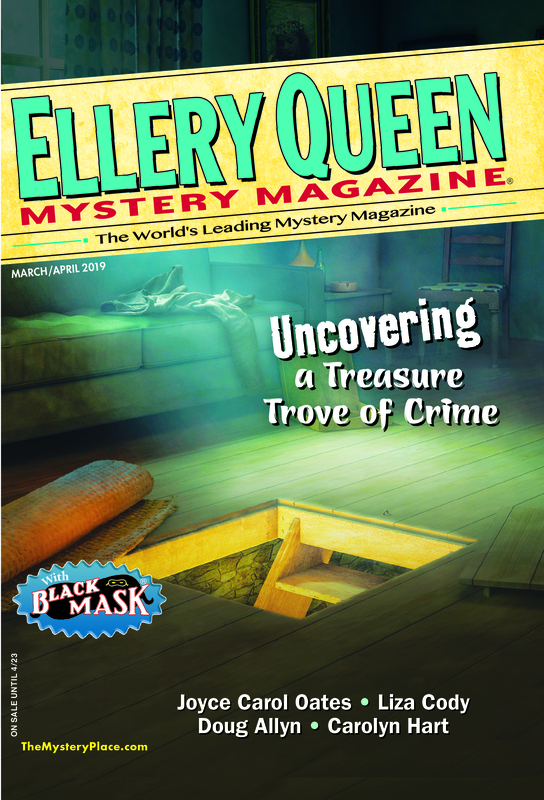 On the other hand, a number of my crime-fiction stories that have appeared in Ellery Queen Mystery Magazine have contained a touch of horror. In “The Walking Path” (July 2015) my main character plods along with an ever-growing sense of dread, while unaware that his daily walk will end in a very unexpected, and terrifying, death. In “Spooky” (Sept/Oct. 2002) a rescued dog drives his lonely owner to distraction by his nightly ritual of barking at a certain hour, unable to be calmed. After he is returned to the pound, his former owner discovers, too late, what all the barking was about moments before he is killed. Certainly, Joyce Carol Oates’ story, “Big Momma” (EQMM Mar/April 2016) is as horrifying a tale as I’ve read in recent years, though it features no supernatural beings. It does, however, feature a family and their pet snake that are not soon to be forgotten, though you may want to. But neither of us was breaking new ground with these stories, in which crime flirts with horror; Poe was there long before us. His renowned “The Murders in the Rue Morgue” is generally considered the earliest story of criminal detection in fiction, and what a case the hero has on his hands—a razor wielding orangutan! The description of the crime scene and the murdered girl in the chimney has to be one of the most chilling in literature. Yet, many of his horror tales were built around criminal acts. In “The Tell-Take Heart,” long considered a classic in that genre, we are treated to the murderer’s narration of his heinous crime and its reasons, in what is also an early experiment in the marriage of psychology and fiction. Our killer is haunted by the beating of his dead victim’s heart, a heart that grows ever-louder in his ears, yet the policemen cannot hear it! In the end he is forced to reveal his crime and the dismembered body that lies beneath the floorboards the officers stand upon. One of my favorites, “The Cask of Amontillado”, begins not with a fait accompli but a crime in progress. While nursing a long-held, yet never revealed, grievance, the killer-to-be lures his victim ever deeper into his family catacombs, an underground cemetery that serves double duty as a wine cellar. Promised a glass of a rare and splendid Amontillado his drunken victim stumbles along in his path, oblivious to the warning signs that this will be his final tasting. When they arrive, at last, he finds a tomb prepared by his convivial host awaiting him, and begins to comprehend what is about to happen. His pleas for mercy fall on deaf ears, as the narrator buries him alive within the dank walls of the cellar. Horror . . . ? Crime fiction . . . ? Yes, to all of these. For writers like me, who walk between sunshine and shadow (which accounts for most of us, I suspect), Poe remains an inspiration, as his stories, too, often blurred the lines between mystery and horror, crime and terror. Though he could be a purist when he chose; stories like “The Mystery of Marie Roget” and “The Purloined Letter” were tales that required no terror. Horror stories such as “The Fall of the House of Usher” and “Hop Frog” required no detectives, no prosecution. Poe did what he always did whatever story he was writing, he focused on the denouement, that penultimate moment when it all had to pay off for the reader, and he did whatever it took. Blurring lines would have been no accident, I think, for Edgar Allan. This time of year, I always find myself thinking about Poe and his stories and poems. October is his month in my mind—what with Halloween capping it off, and days of ruminative beauty leading up to the ghostly celebration; winter hidden, but sometimes felt in the breeze, the rustling of the dying leaves. I wonder how he felt about autumn. It wasn’t as easy to stay warm in his time as now, and his feelings about that might have made him more jaded than me. As for Halloween, it wasn’t celebrated in quite the same way in the first half of the 19th century as today. In fact many folks didn’t recognize it at all, and I have no idea what Poe might have thought of it, or if he did. But, I’d like to think that if we had been on the same Little League team as kids, we would have gone trick-or-treating together on All Hallows Eve. This entry was posted in Characters, Fiction, Gothic, Guest, History, horror, Memorial, Readers, Story, Supernatural, Writers and tagged crime, detective, edgar allan poe, halloween, history, horror, mystery, poe, readers, reading, writing. Bookmark the permalink. Really great piece. I remember as a young boy reading The Hardy Boys and then, somehow, stumbling across Annabel Lee. It was the first time I realized the great range writing could span. I look forward o your next EQMM story. Thanks, Lou. Annabel Lee was the only poem I ever memorized. Poe’s verse holds up very well, I think. Love this post! Catching up late (Bouchercon) but appreciated having it waiting for me. And happy Halloween ahead! So glad that you enjoyed it, Art. Happy Halloween to you and your family, and congrats, once more, on your award at Bouchercon! Great post! Perfect for Halloween. Thanks for that, William. I hope your Halloween is a great one!